Tonight is Halloween but it's looking like we may not get to do a lot of trick-or-treating due to the rain. We have had fun this last week getting ready for Halloween though. Last weekend, Patrick and I went out on the driveway and carved our pumpkin. I expected him to last a few minutes then get bored but he ended up loving the entire process. He was a big help in getting the "gook" (his word for it) out of the pumpkin. 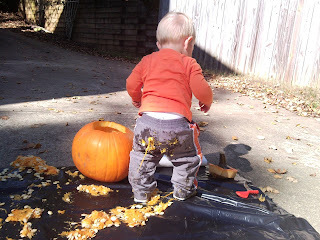 He also found out that pumpkin gook is very slippery and by the end of the carving he was covered in it from his waste down after slipping and falling in it over and over. At the end of it, he was excited to see a face on the pumpkin and because it had a face, it needed to be kissed...several times. Despite attaching a personality to the pumpkin because of the face, he still tried to eat the insides. Judging by his expression, I think Patrick found out why we don't eat the inside of our pumpkins. Welcoming the cupcake with open arms. He looks so inviting and happy to see it. Just burped after finishing the cupcake off. At least he was polite and covered his mouth. So hopefully we'll be able to go out tonight at least to a couple houses. Patrick is going as a fireman instead of the originally planned lion (he wouldn't keep the hood of the costume on for more than a minute). I put up a photo album for Halloween 09 with a few more pictures from the pumpkin carving. We'll also be putting the pictures we take tonight up there. You can find the album here. Hope everyone has a good, safe and dry night!